Samsung Galaxy S3 sports a beautiful Super AMOLED high resolution screen with amazing 4.8 inches, which makes it very convenient for surfing the web, reading, watching movies and gaming. Combined with a powerful Quad-core 1.4 GHz Cortex-A9 processor, this allows you to do a number of amazing things with this phone. The selection of apps you might find interesting is huge, but we will mention the ones we liked using and think that you might find interesting. This app gives you a chance to listen to your favorite music wherever you want, without burdening the phone’s memory too much. The app offers ICS support and allows you to listen to your music even when you are offline. Basically, a must have for all music lovers. This app is specific to S3 and is capable of providing you with essential information pertaining to your health and wellbeing. You can use it in combination with a number of devices, which gives you additional options for keeping track of relevant information such as blood sugar or pressure. This app really makes use of the large screen of your new phone. It allows you to view your favorite online magazines. You can find a great number of publications, easily readable in the apps great interface. This feed reader app allows you to have all your favorite feeds and condensed information from blogs and sites you frequent easily accessible from a comprehensive and easy to navigate grid view. You are presented with the article title and a relevant image which helps point your attention in the right direction. This great app will help you type with ease, speed and precision. The more you use it the better it gets at understanding what you tried to type, and after a while will do the most of your work for you. There’s a month long trial period which should help you make up your mind on whether you want to give money for it. 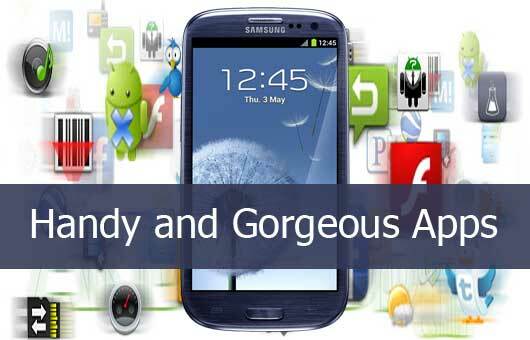 As it name implies this app lets you use your S3 as a remote control. It only works with Samsung Smart TVs, but if you own one it can come in very handy. Another app which relies on the large screen of your handheld; Kindle lets you browse a wide selection of e-books, a lot of which are completely free, purchase them if they are not, and read them with ease and comfort. Pretty much a must have even if you are not too into books, just for the sheer variety of the offered material. While Android’s default browser is decent enough, Google Chrome really lets you get the most out of browsing experience. The large screen facilitates navigation and makes content easy to view. The app is fully syncable with your desktop Chrome for the seamless transition. This includes importing bookmarks and preferences as well as your autofill data. This app replaces your standard Android launcher, giving your S3 a completely new look and easy access to your Facebook updates and options. Naturally, if you don’t use this social network too often, there’s not much point in using the app, but if you do, you might find it very useful and interesting. This app gives you an alternative image gallery which lets you organize the pictures on your phone in the way that you find most suitable, offering far more flexibility and options than the default Android gallery.